To protect, promote and improve the health and well-being of people of all generations and create healthy places to live, learn, work and play. 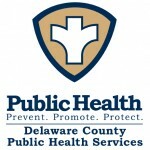 Delaware County Public Health Services, located in Delhi, NY, serves the residents of Delaware County. Delaware County is the fourth largest of New York’s 62 counties and is the sixth most rural. The county is bordered by 7 counties and the state of Pennsylvania. Click on Any Title for the Latest Info from Public Health!